At Munchy’s we believe people are an important asset in making our products the most irresistible CHEEKY FUN food brand in town. Munchy's believes in a CHEEKY FUN work playground where we develop and build upon each other's strengths to achive our highest potential. We're looking for people who can generate ideas to build true competitive advantage and who can continue to help make our Company outstanding. If you feel you could be part of a team like this, join us today as our team. At Munchy’s, we believe that our people are like the best parts of a Munchy’s treat. Chocolate chips, creamy wafers, crunchy nuts…each and every employee is an essential player in making Munchy’s the awesomest biscuit in town. 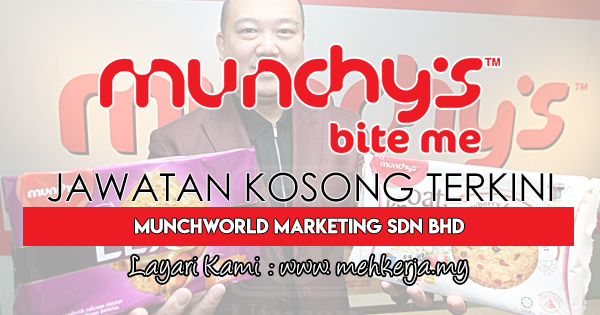 0 Response to "Jawatan Kosong Terkini di MunchWorld Marketing Sdn Bhd - 14 April 2019"